Shaving pubic hair become a fashion trend all over the world. Since Roman times in many cultures it was a common practice. Many people shave their pubic hair for hygienic and sexual attraction. Buy store disposable razor of good quality. Good effect gives a razor with multiple blades and a moisturizing strip on the work surface. Don't forget to buy the gel or cream for shaving. Regular soap prevents easy sliding of the blade. The best remedy — moisturizing gel with aloe extract and vitamin E.
Short trim pubic hair. Use sharp scissors with blunt ends to protect against injury of the skin. Gently pull your fingers by the tips of the pubic hair and cut them short. You can also use an electric trimmer. This will allow easy access for shaving. Take a shower. Aim the jet of warm water on the area of the pubic for 1-2 minutes. Use a loofah or exfoliating glove. Pubic hair is thick and coarse. 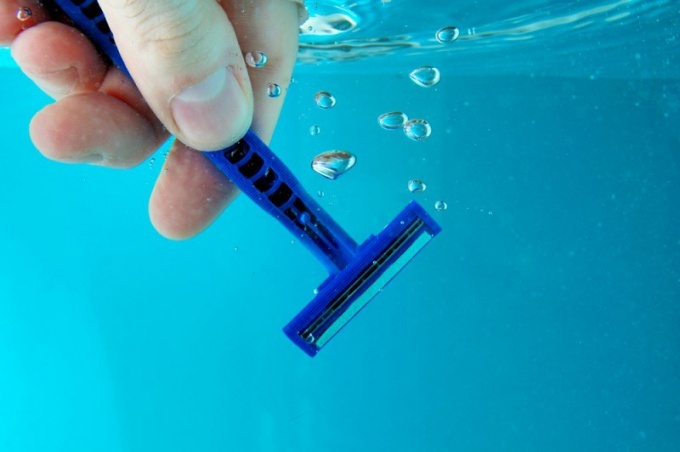 Water makes them more pliable for shaving. During this procedure, open the pores and soften the hair follicles. Apply liberally to the groin area shaving product. This will help to soften pubic hair. The gel will protect your skin from ingrown hairs and cuts. Moisturizing foam or shaving cream will allow you to easily slide the razor across the surface of the pubis. Start shaving, lightly pulling my hair down. Carefully spivayte them from top to bottom in the direction of growth. Do not use excessive force. Wash the razor under running water after performing several movements. This is to prevent clogging of the blades. Shaving pubic hair against the direction of hair growth can cause irritation of the skin. Rinse your pubic area with cool water after you complete these steps. Make sure you have not missed any part of the skin surface. If you like the result, wipe dry with a clean towel to his groin. Apply a moisturizing baby oil to the area you just shaved. It will protect your skin on the pubic area from irritation, itching and acne.